The ultimate exfoliating washcloth for face and body. 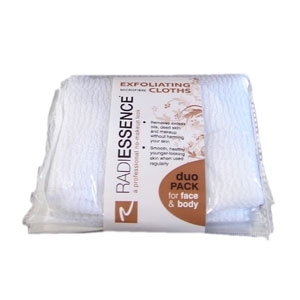 Use with the RADIESSENCE Makeup and Tan Remover to remove makeup and residual tan or in the shower as an all body exfoliating cloth. This duo pack has a small wash cloth for the face and a larger wash cloth for the body. Each wash cloth can be reused up to 60 times.